It was my first time at Las Margaritas. 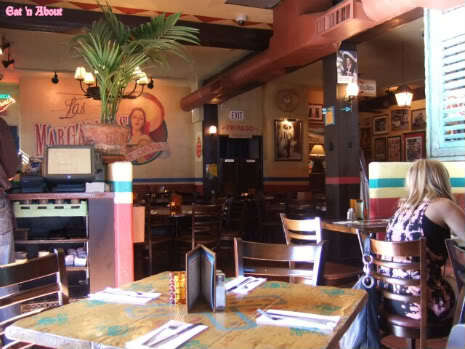 It had a very warm ambiance and at the time we arrived it wasn’t particularly busy. The sun was out too! 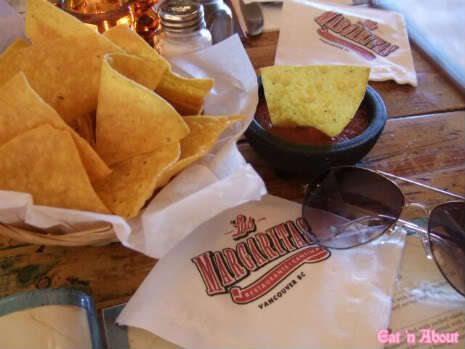 They start you off with their homemade salsa and chips. 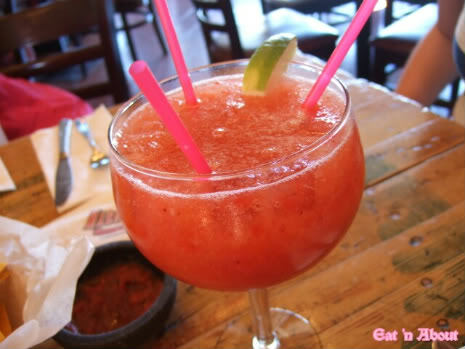 Apparently Las Margaritas had won awards for this. It was good. The chips were crispy, the salsa fresh, but I’m not sure if it’s award-worthy. Mind you I’m not an expert on tortilla chips and salsa. I believe refills cost money. 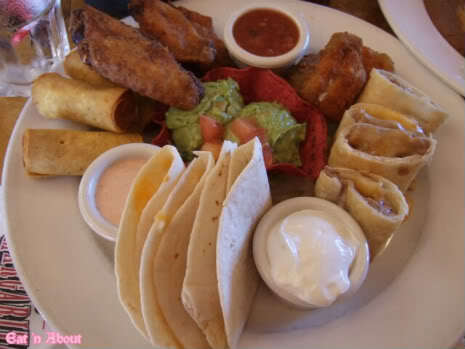 My fav of the 4 was probably the chicken taquitos (or maybe the guacamole). It was like a spring roll with seasoned chicken inside. The chicken wings really weren’t anything special, not especially spicy either. I was afraid the jalapeño poppers would be too spicy but they’ve only got a little kick to them. But still I could only handle one. My least favorite was the quesadillas. They were pretty uneventful. But the guacamole and sour cream made them a lot better. 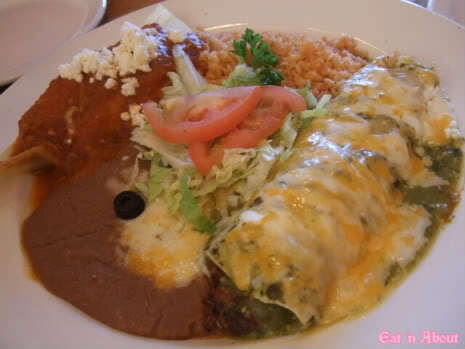 Next we picked the Numero Ocho ($15.65) which were the Chicken Tamal and Beef or Chicken Enchilada Verde. We picked the beef enchilada. Honestly, by the time this came, we were pretty stuffed from the margarita and the appetizer sampler, but we did still manage to grab a few bites. The sauce on the chicken tamal was a bit sour for my tastes, but the tomatillo sauce on the enchilada was very fresh and tasty (I’m sure the cheese helped too). I didn’t really care for the beef though as it was a bit dry. The sides of refried beans and rice were typical. I never really liked rice dishes that aren’t Chinese/Asian anyways. The refried beans were good as always. Even though it looks dry it wasn’t. We sopped it up with the free tortilla chips. Next PostDine Out Vancouver 2011: Rocky Mountain Flatbread Co.